The city of Baltimore has been the focus of movies and several popular TV series over the years. Although not as telegenic as New York City or as charismatic as New Orleans, moviegoers have come to recognize Maryland’s largest city through its depiction in pop culture. The city is also the second largest port of call in the mid-Atlantic United States. Its port is one of the busiest in the nation because it is a hub for distribution to the Midwestern markets. The current population of Baltimore is just over 621,000 and growing steadily. Home sales in the Baltimore area have experienced an uptick recently and the average price per square foot also saw a 2.2% increase over the previous year. Conversely, home prices have seen a slight decline over the 12 month period with an average weekly fluctuation of 0.4%. Analysts forecast a continued lull in home values with minor fluctuations from month-to-month. Baltimore has several popular neighborhoods including Canton and Patterson Park. Two-bedroom and three-bedroom homes are currently available on the market in many neighborhoods. Anyone interested in four-bedroom single-family homes or larger floor plans can still obtain excellent results within city limits. Low interest rates and attractive home prices have resulted in a steady growth in home sales within the Baltimore area. Foreclosure properties are much in demand especially in more affluent neighborhoods. 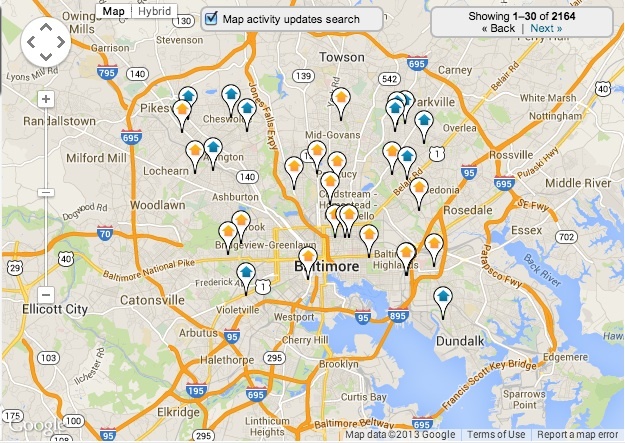 Homebuyers who are looking to find great value should consider Baltimore city.